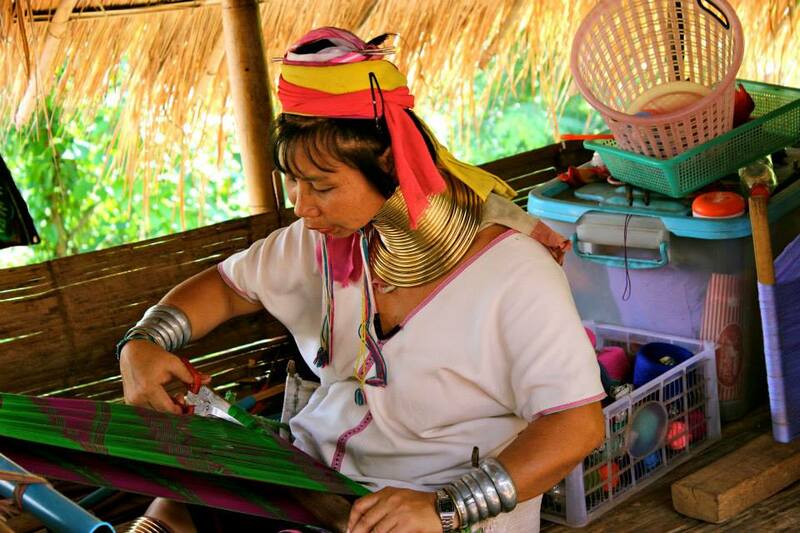 The Karen Hill Long Neck Tribe is one of the most unusual and culturally rich people in the world. The first thing you’d notice is that the limbs of the women (and in some instances young girls) are sheathed in rings of gold. “You want scarf?” They ask quietly and repeatedly, as they watch you walking around their village, their eyes urging you to buy something. 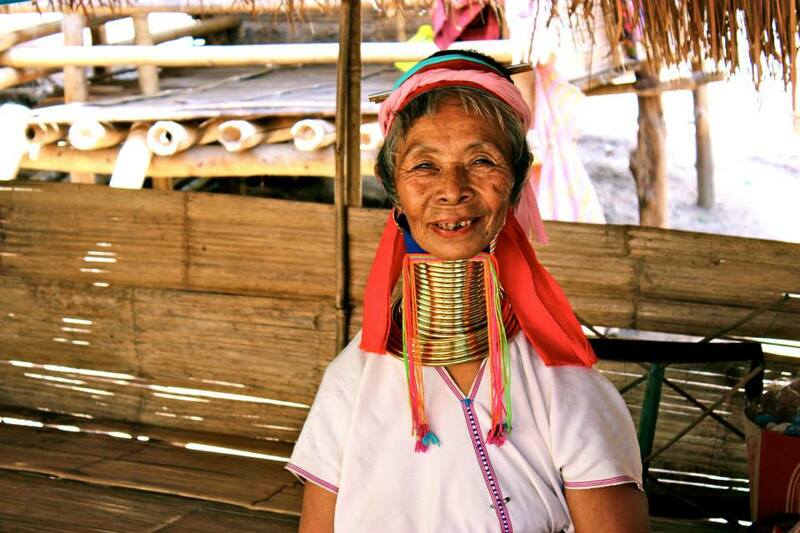 Whilst in Thailand we really wanted to visit the Karen Hill Long Neck tribe. 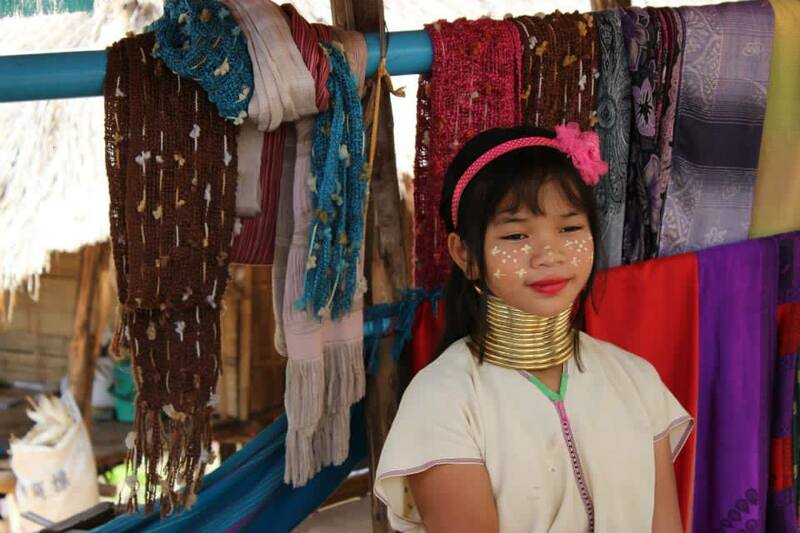 The Long Neck Tribe in Burma had suffered oppression at the hands of successive regimes of that country for decades. Forced re-settlement and labor, incarceration, denial of political representation and citizenship status rights (among other human rights violations) led thousands of the tribe to move into Thailand. While many argue that they have a better life in Thailand, their status is yet unsure. Many of them are in Thailand as refugees with no identity cards and therefore no way of ever leaving. Whilst some tourists have compared visiting this village to a human zoo, tourism is their only way of survival. Morally, would it be better to stop tourism there completely in order to maintain their ‘dignity’ and therefore let them suffer more hardships from poverty? It’s a hard call, I don’t know if there is a right or wrong answer really but I think it’s better to continue to support tourism there in order to support their livelihood. They seem to have no issues with it themselves, after all they’ve purposefully created an entire tourist park around them. It was pretty impossible to go visit the tribe without being on a tour, specifically one without elephant rides included, as the tribe are renowned elephant trainers. In a smart move by the tribe they created a tourism hub on their lot of land. The elephant park and zip line park have created business and therefore a living for this tribe. On the tour you first get picked up and driven to a butterfly sanctuary, which was terrible. I think their was honestly five butterflies in the place. We then got dropped off at the village to meet the Karen Hill Long Neck Tribe, which was a few minutes walk from the elephant park. The women and young girls were sitting around creating handmade scarves, which they sell for about $5 each (of course I purchased one). The older the women get the more brass rings they put around their necks, wrists and their shins. We tried on a pretend neck ring that only took up half our necks and they were ridiculously heavy and uncomfortable, apparently by time they put on their last ring each section weighs about ten kilo’s. This jewellery never, ever comes off, even after death. The myth that these are worn to elongate the neck are just not true, or physically possible. In fact the appearance of a longer neck is a visual illusion. The weight of the rings pushes down the collarbone and upper ribs to such an angle that the collarbone appears to be apart of the neck. There are many accounts as to why they practice this bizarre custom. Their own mythology explains that it is done to prevent tigers from biting them. Others believe that it is to make the women appear so unattractive that it makes them less likely to be captured by slave traders. The most common explanation though, is the complete opposite of this, that an extra long neck is considered a sign of great beauty and wealth and will attract a better husband. Adultery, however, is said to be punished by the removal of the rings. In this case, as the neck muscles have been severely weakened by years of not supporting the neck, a women must spend the rest of her life lying down. The reported cases of adultery or divorce within these tribes are therefore very low. Whatever the origin of the custom, one of the main reasons it continues today is for tourism. Their were a few women who were the odd ones out who had chosen to not wear them, I’m not sure if the reason was medical or if they were apart of a sub-group who do not and have never followed this custom. It was so interesting to see this unique society with our own eyes, to watch them work and talk to them. It’s something that’s been on my bucket list for years. 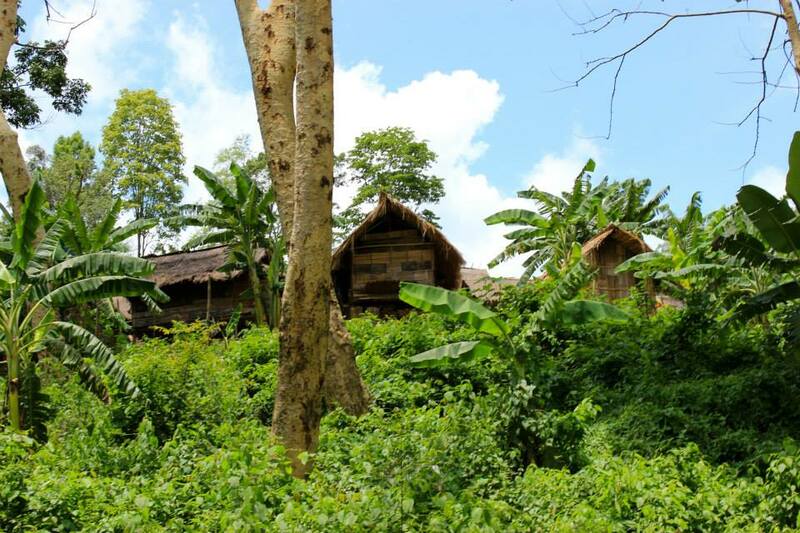 Of course their village was basic, made up of thatched huts, but they seemed happy and healthy. 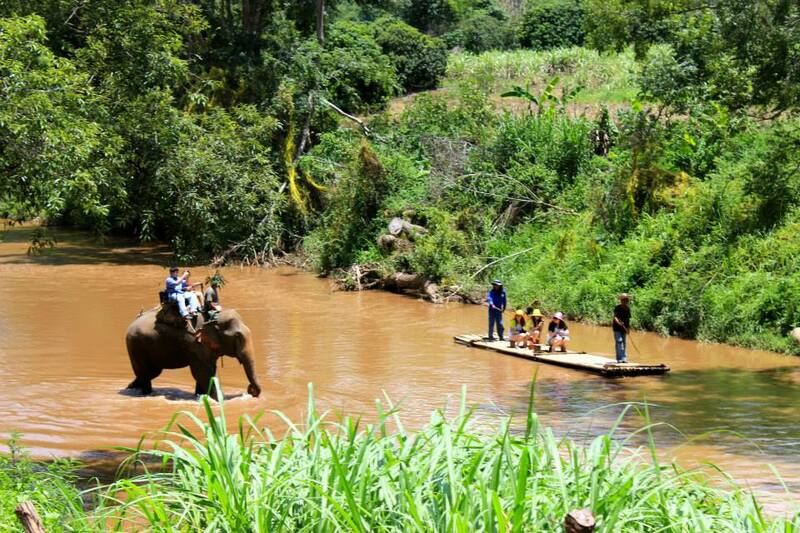 After this we were taken to the elephant park where we rode the elephants through the jungle and through the river. It wasn’t the best elephant park or elephant ride I’ve ever visited, if it were not for the village people I would not recommend it. I love elephants and visiting them around the world but I do not like the idea of them being chained. But at the end of the day that’s their livelihood. It’s a hard topic. 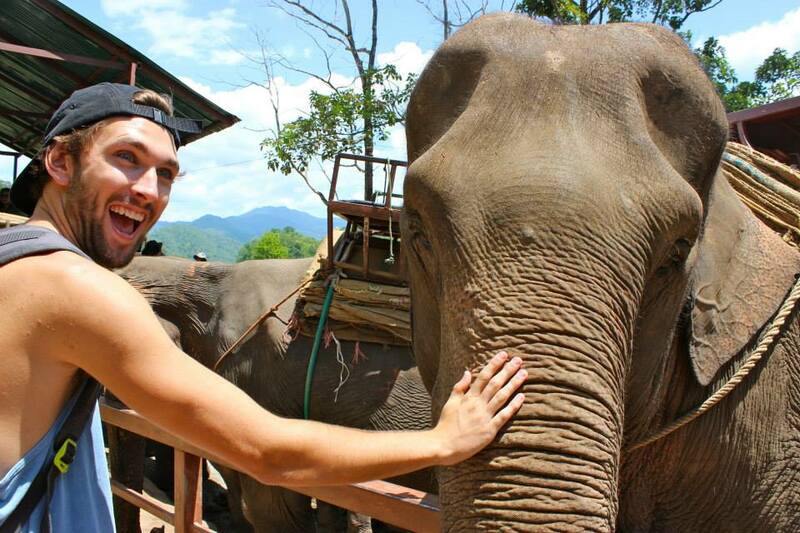 This was Andy’s first encounter with an elephant and, as you can see from this photo, he was ecstatic. After lunch we had a visit to the limestone waterfalls, which were lovely and refreshing with layers of the coldest water we’d had enjoyed since being in Thailand. After this we had bamboo rafting, which was quite boring. We literally just sat on a raft made of bamboo as a man slowly paddled us down the river. It was cool to see the local kids jumping of trees into the river but besides that the thirty minutes were slow and hot. 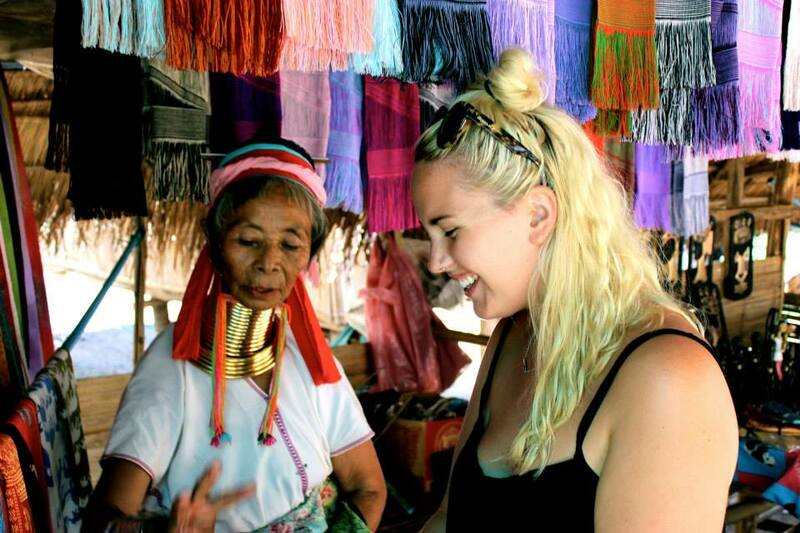 It wasn’t our favourite tour in Thailand but we did enjoy the village, the rest is just inevitable. The tour cost us $20, so it wasn’t bad value for an average day out. It should still go on your list for the cultural experience alone. For more blogs on Thailand click here! Over to you. Have you visited the Karen Hill Long Neck tribe? What were your thoughts on the place? Im planning to go by myself. no tours. how much is just for the entry to the village? how long is it from Chiang Rai? How much did you pay for the tour? can you mention which travel agency did you hire? Please advise. I don’t remember to be honest, it was just the cheapest travel agent on the street. It would have been less than $20 definitely, but unfortunately I cannot remember. Sorry!